October 31, 2017 – Hang on Baby! I often think about that picture of a cat hanging on for dear life, to a table top. The expression on the animal’s face says it all. 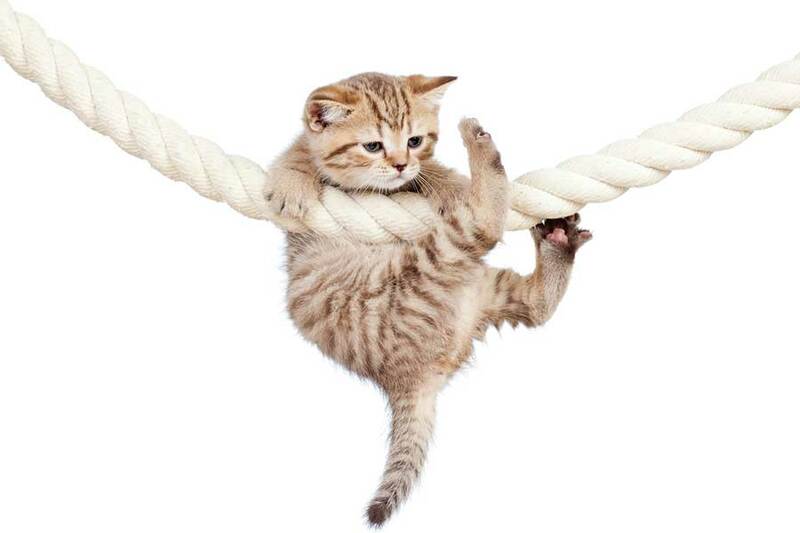 Just like the cat, sometimes all we can do is pray and hang on. Perseverance is defined as steadfastness or persistence. It is one of those character traits we admire but don’t really like to experience. A good friend of mine, Bob Schmitt, owner of Mack’s Fishing Lure Company, tells a story from his youth when all he could do was to “hang on”. Bob and some of his teenage Southern Utah friends decided to do their first big game hunting trip together. These determined lads packed a lunch, loaded up their guns, and headed to the nearby woods. They split up and began their hunt through the forest. Bob went uphill and his two friends went downhill to scope out the lower forest. Within an hour Bob spotted a small herd of five deer about 250 yards from his position. He brought up his Remington 700 30.06 and began checking out the deer. A nice 4X4 mule deer appeared in his scope. Bob peered through the lens and squeezed off a round. The deer appeared to Bob to be hit but didn’t go down. Bob and his friends headed up the hill to see if they could track the animal. Shortly thereafter, Bob saw the wounded deer staggering in his direction. He again fired a round. This time the old buck hit the ground. With shouts of joy Bob ran up to the buck, placed his gun against a nearby tree, and pulled out his trusty knife to bleed out the deer. Just as he mounted the deer and raised its head to expose the neck area, the dazed deer stood up and began to run downhill. Bob was now becoming a rodeo star right in front of his friends. With Bob on its back, the deer passed by his two astonished friends who were laughing out loud and evaluating Bob’s ability to stay on. While trying to keep his balance, all Bob could do was “hang on” to the antlers and ride it out. He knew that eventually, the animal would slow down enough for him to escape. After jumping off the animal, Bob ran back to the tree where his gun was placed, aimed at the runaway deer, and squeezed off another shot that brought the deer down permanently. This adventure really did happen. Today, many families are coping with various issues that could feel just like riding a wild animal and the only counsel one can give them is to “hang on”. I know two wonderful families who are currently going through very traumatic circumstances. One middle-aged man is fighting cancer as his young family wonders about the future. Another couple that Louise and I are close to has a daughter who is struggling with her pregnancy, an older mother who is very sick, and the unknowns associated with a new start-up business venture. Psalms 46:1 Reminds us that God is our refuge and strength. Are you regularly seeking His counsel by reading His word? Who are the people who can help you find God’s peace, power and presence? Remember, the resources and people at Men’s Ministry Catalyst are always available. Feel free to contact us through mensministrycatalyst.org. God loves you and so do we!